Check out the 3Doodler Start 3D Printing Pen at Ink N Toner UK. This 3D pen is from the makers of the world’s first 3D Printing Pen. You can rely on 3Doodler to provide you with high quality products. You can doodle anything in 3D with this safe and easy to use 3Doodler Start 3D Pen which has been designed for young creators. You can have unlimited fun as you can create anything from landmarks, animals to everyday objects with this 3Doodler Start 3D Pen. The fun is limited only by your imagination. The 3Doodler Start 3D Printing Pen inspires creativity, design, planning, building and spatial understanding. So it’s perfect as an educational tool. Using the 3Doodler Start 3D Pen is very easy. All you need to do is pick a colour and then insert a plastic strand into the 3D pen. Slide the on/off switch to turn it on. Allow 1 minute for the pen to warm out. If you are out of power you can charge it up quickly and easily by plugging in the cable in the micro USB port. The red indicator tells you that the 3D pen is warming up. The flashing yellow means it is charging up and the Green indicator means that you are ready to doodle. To start doodling simply click on the large orange button to start and click to stop. You can also double click to reverse. It will take around 10-15 seconds for a new strand to feed through the pen, then you can start doodling in 3D. The plastic hardens after a few seconds, giving you time to shape your doodles to perfection. What’s great about this 3D pen is that it lets you draw in the air or an any surface and hardens within seconds. What’s more, this set comes with all the essentials for you to use this 3D pen straight away, as it comes with the 3Doodler Start Idea Booklet to get you started on some cool projects. This 3Doodler Start 3D Printing Pen is safe and clean to use as it uses specially developed plastic made just for this pen. There are no hot parts, no messy resins or glue. The 3Doodler Start 3D Printing Pen lets you doodle anywhere as it is wireless as you can charge it up and operate wirelessly. It even works plugged in too. 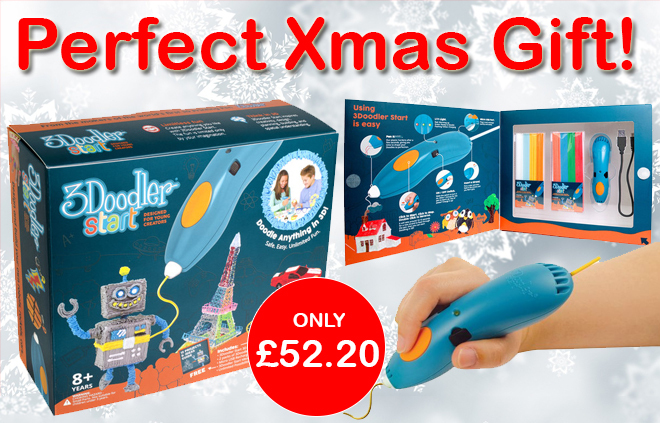 This 3Doodler Start Essentials Pen Set will make an ideal gift for anyone this Christmas. Get yours now before Christmas by clicking here. 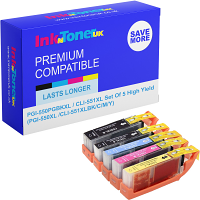 The 3Doodler Start Essentials Pen Set at Ink N Toner UK, is in stock and ready to be dispatched immediately.